However, medical practices may not realize they also have a range of financial options when it comes to reimbursements. Not only can choosing the right mix of payment methods reduce your office workload, it can also yield substantial cost savings. Accelerating reimbursement has become particularly important as patients take on more responsibility for a greater percentage of their medical bills. High-deductible health plans and patient self-pay affect practices by increasing payment periods – and risk. In fact, the likelihood of collecting payment from the patient decreases by as much as 50 percent every 30 days. After three statements are sent with no activity, the chances for patient payoff are as low as six percent. Today’s new financial environment presents higher risks due to patient payments, which puts more emphasis on other aspects of economic stability, increasing the urgency to optimize reimbursement methods. Physician practices, many of which are looking for any and all ways to increase their margin, need to examine their options and select the best mix of payments based on the payer and back office protocols. A January 2014 mandate requiring all payers to support electronic funds transfer (EFT) and electronic remittance advice (ERA) was created to decrease costs for both payers and providers. However, while payers embraced the opportunity to reduce processing costs, acceptance by providers has lagged. The adoption rate for medical providers is stuck at approximately 60 percent for claim payments and 50 percent for remittance advice, increasing just one percent from 2015 to 2016 (2016 CAQH Index). So, what are the payment options for medical practices, and how do they compare? The most venerable payment method, paper checks remain a viable and popular form of payment – 97 percent of companies across multiple industries that participated in a 2016 research study say they use paper checks to pay at least some vendors and receive some payments. Advantages: For many practices, checks are the default payment method. Not only are checks reassuringly familiar, some practices also see them as a way to save money by avoiding credit card processing fees. Checks also offer a paper trail with physical evidence of payment, receipt and deposit. In addition, the remittance information travels with the payment, easing reconciliation. Disadvantages: Checks are time-consuming and expensive. The 2016 CAQH Index shows that healthcare providers spend, on average, an extra eight to nearly 30 minutes processing a manual transaction in comparison to the time required for an electronic transaction. There is also a high potential for fraud, as checks can be physically stolen, altered and cashed. ACH represents the most popular form of EFT and is widely used in other professions and industries. 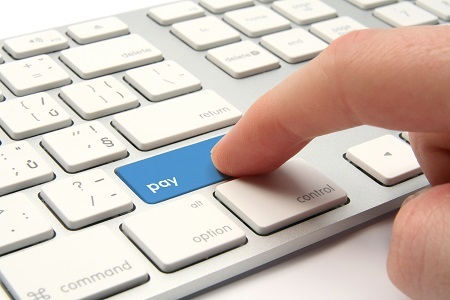 Advantages: Receiving payments electronically can streamline workflow and ease administrative burdens. Not only are funds available sooner (no mail delays, no float), it also reduces the risk of fraud, as employees no longer have access to checks. Disadvantages: The greatest drawback to widespread adoption of ACH for medical practices is the disconnect between EFTs and ERAs. Because the electronic remittance advice is sent separately – and often at a different time – it can be time-consuming and difficult to reconcile payments and billings. For a practice that closes out its books monthly, the EFT batch payment may arrive during one month and the ERA during a different financial period, creating confusion and the need for manual entries and reconciliations. An additional hurdle to ACH acceptance is the need to enroll – and share confidential bank information – with each payer. For some providers, the number of payers with which they work numbers in the hundreds. Along with concerns about sharing bank information, individual enrollment can be time consuming. Virtual cards are relatively new to the healthcare marketplace, although they are widely used by other industries. Payments are made to providers via single-use cards, with the information transmitted to providers through online display, fax, or mail. Disadvantages: Like physical credit cards, virtual cards incur a processing fee. Also, there is some manual processing involved, since providers must key the card information into their card processing terminal. Financial pressures on physician practices are not expected to ease; in fact, the number of self-pay patients and those with high-deductible health plans (HDHP) continues to climb. According to an athenahealth white paper, one million Americans had an HDHP in 2005. That number had risen to 17.5 million Americans by 2014, and as many as 40 million Americans are projected to have HDHPs by 2018. This fact puts physician practices at financial risk, necessitating a greater attentiveness to optimizing timely, accurate payment from payers. With a variety of payment options available to practices, those that craft a payment strategy that minimizes risk, accelerates payment receipt and streamlines office processes are better positioned for continued success.